I’m always up for a good hike, and it often turns out to be a great way to see places most people don’t see. One of the places people recommended I visit in Ireland was the Ring of Kerry. As luck would have it, the tallest mountain in Ireland, Carrauntoohil, is within the Ring of Kerry. 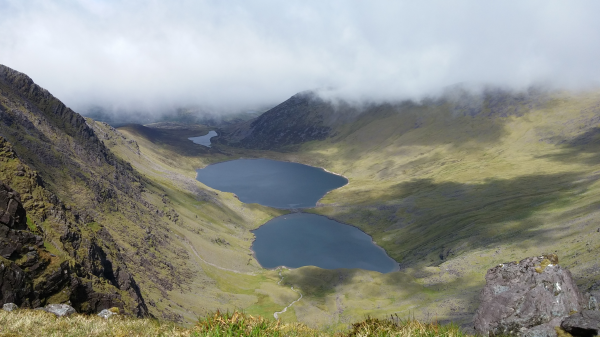 I did a bit of searching and learned about an alternate route, the Coomloughra Horseshoe, which starts from a different place than most people who hike Carrauntoohil and makes a loop that tops the three tallest mountains in Ireland, Carrauntoohil, Caher, and Beenkeragh. I was hoping to do the complete Horseshoe, but was also paying very close attention to the weather. 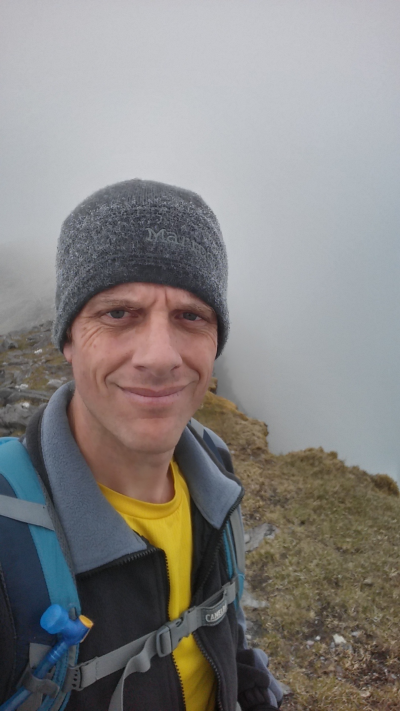 The route between Carrauntoohil and Beenkeragh involves a climb over a razor back ridge that seemed like a bad idea if it was raining or cloud covered. I got up early, had a hearty breakfast of sausage and eggs at my B&B, then headed to the trailhead. No one else was parked at the trailhead, but I assumed some others would be coming along later. Me at the Caher summit with condensation on my hat. Unfortunately, at this point, I had the crazy notion that the trail turned slightly on its way to Carrauntoohil. Not sure why I thought that, but I got off the actual trail and spent about 30 minutes wandering off the horseshoe before I realized I was off the trail. 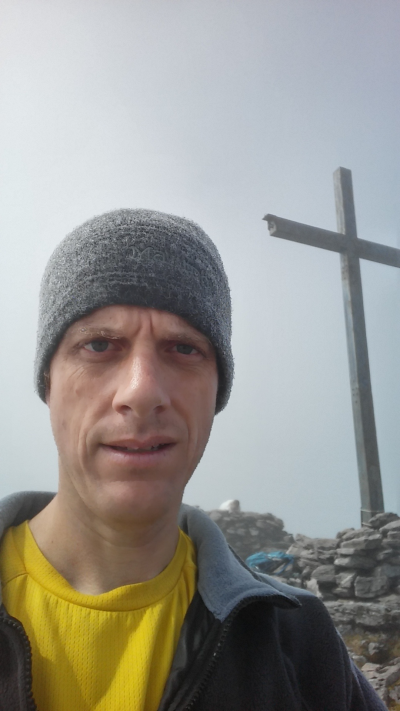 Thanks to Google Maps and my GPS, I got back on track and headed toward Carrauntoohil. After they finished up, I confirmed that they were priests, then took a few pictures as the sun had finally broken through the clouds. 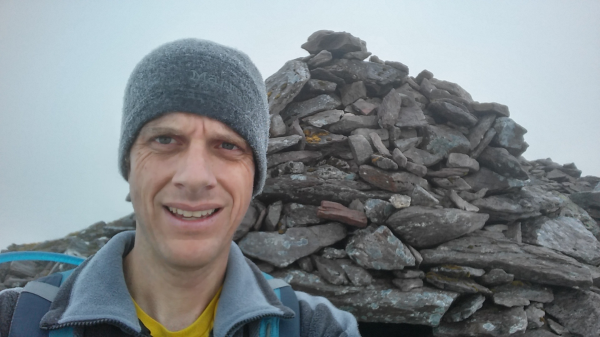 On the summit of Carrauntoohil. I spent about 20 minutes on the summit, then, because it was still very cloudy, I opted to go back the way I came rather than try the razorback. It was so cloudy I immediately took a slightly wrong turn and headed down the standard route. I hiked for about 30 minutes before I realized my error and had to hike back to the route I had taken, which added another 30 minutes or so to my hike. Once I made it back to the trail, the clouds started to break and I finally started to get some nice views of the area. Near the summit of Caher once the clouds broke. The valley below Carrauntoohil once the clouds cleared. A panorama of the three peaks. The rest of the hike was quite pleasant and I finally passed a few other people on the trail. 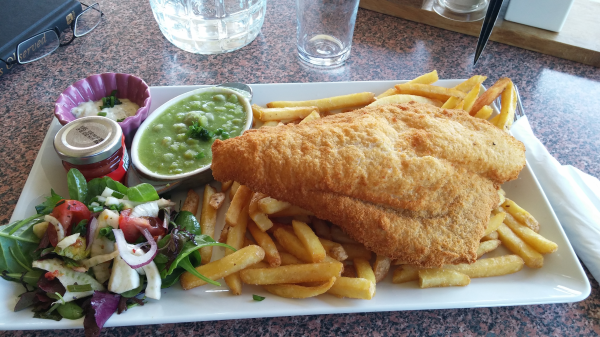 Fish and chips at the Killarney Golf and Fishing Club.